Clannad, especially in this first season, is a free-spirited, slow-burning, and ultimately romantic slice-of-life. It is a mish-mash of whimsical, childish humors and melodramatic, yet sometimes ethereal reflections & revelations. While it is overly immature at times and is overall lacking in substance & consistency, it has one aspect that allows the whole season to resonate when viewed under the right lens; that it is wholly emblematic of the end of adolescence. This is a difficult season of anime to separate from its series to discuss standalone. The standard visual novel adaptation setup and abundance of common rom-com tropes don’t make it clear what Clannad is or where it’s going. Clannad is so named due to a misunderstanding about the Gaelic word for family, but much of this season focuses on high-school events. The series as a whole is known and often judged by its reputation as the poster-child of “anime that will make you cry”, but many will find this season’s heaviest moments to be melancholic at most. Before getting into the meat of this anime, one must leave their pre-conceived notions at the door. Strangely fitting as it is, this is a teenage Clannad on display. It struggles with self-reliance and often fails to heed the criticisms surrounding its ilk. Yet the patient and caring observer will be able to see that it is isn’t done preparing itself for that fateful first step out the door and that its strengths, though not fully realized, see it capable of admirable deeds in the right circumstances. All of this is readily apparent right out the gate in the first episode’s first scene. "Oh wow, how many other times has this type of anime started with the sak-" just be quiet and soak it in a little, okay? Clannad opens with its protagonist, the troubled delinquent Tomoya Okazaki, at the bottom of the hill his high-school sits atop. He despises his lot in life, and is convinced he has good reasons to feel that way. At the foot of the hill stands another student, Nagisa Furukawa, and her optimistic yet uncertain demeanor plays an odd contrast to Tomoya’s assured negativity. Nagisa suddenly exclaims her favorite food of all things, sparking a brief conversation that Tomoya passes off as inconsequential as he begins climbing the hill. Now a critical thinker who is versed in this medium and its genres will see ample reasons to say “I’ve seen this countless times before”, “I bet he meets the tsundere next”, or perhaps “they should have just called this Kanon II”. They truly can’t be blamed either; these are indeed all valid responses to an opening as standard as this. It’s an unfortunate truth, as in this scene also resides the very spirit that comes to define Clannad. It can be seen in Nagisa’s silly introductory line inciting enough curiosity to get Tomoya to listen further. It can be seen in Tomoya’s assuredness being given to Nagisa in response despite his negativity. It can be seen in the very hill the scene takes place on, as it’s not just a part of the school or even just the town, but a part of life, one that Tomoya has unwittingly began climbing. All of that is thematically referenced throughout the series. Though it’s hard to tell from the get-go, there is an underlying yet overarching story layered within the otherwise typical high-school + supernatural shenanigans Jun Maeda is known for. This persistent usage of typical & expected events as a vehicle to deliver deeper connected meanings is both Clannad’s greatest strength and biggest weakness. Not many of these events are as layered and few still are as important as the scene at the foot of the hill, but a lot of Clannad’s scenes, despite how uninspired they may appear on the surface, often carry a piece of the underlying story that ties the romance, drama, and childish comedy together. The supernatural elements of the story often act as the visible strands, especially the “illusionary world” that seems to represent occasional dreams yet seeps its way into surface-level events. It all makes Clannad accessible to younger viewers without necessarily being too shallow and pointless for a more mature audience. However, the overarching story encompasses the whole of Clannad, not just this season, so the viewer’s focus will tend to be set more on the standard high-school rom-com on the surface than the layered and slightly supernatural drama that only begins here. The story of the illusionary world only begins here, but it's connected to the surface-level story both subtly & directly as this season goes on. As I’ve implied thus far, the surface-level story is childish, clunky, and doesn’t tell much that hasn’t been told better elsewhere. It follows Tomoya’s interactions with a standard harem’s variety of girls as he helps sort out their problems and gets to know more about them in turn. It’s a setup that heavily relies on characters to make a worthwhile experience, and Clannad’s cast is not properly balanced for this. Tomoya himself is a fairly competent individual whose strengths and flaws often come into play as he goes through each arc (though his development is rather light in this season). The side cast has a number of effective foils for Tomoya and the main girls (like Nagisa’s father Akio who is always putting on acts and Tomoya’s friend Sunohara whose loud and careless demeanor gets him in frequent trouble) who occasionally give the anime a quirky charm. Unfortunately, Clannad fumbles the handling of its main girls, which is where a lot of its problems truly lie. The common complaint is that the majority of them act more like children than budding adults. It’s something that the characters in question have reasons for inside the story, but nonetheless severely hampers their development and ultimately the quality of their surface-story arcs. There’s Nagisa (whose mystery illness plays a role in her arrested social development), Kotomi (the quiet autistic savant; not that she displays a whole lot of intelligence in the story, but she certainly displays a complete lack of social skills), and Fuuko (basically a loud Kotomi with an obsession towards starfish and no claimed savantism. Her actual reason for being childish is a spoiler). Nagisa does get enough development to be tolerable thanks to having her arc come later and from her more central story role as the heart of the drama club used to connect the story segments. However, the early arcs of Fuuko & Kotomi do nothing to make them hold any purpose beyond being shallow copies of previous Key characters. Those of you who have seen Kanon probably already know which characters they're copies of, and their arcs are copied almost as much (the differences being that all that made those two characters in Kanon meaningful is torn out and forgotten). For those of you who have seen Air, I’ll have to get back with you after I’ve seen it. With arcs that are mostly inferior recycled versions of previous Key arcs that only have Clannad’s underlying story to keep things interesting (unless melodrama, meme pranks, and repeat jokes can hold you over) there is no consequential rebuttal for the criticisms leveled against these characters. "Genius" at work. Clannad features only the freshest jokes on repeat. Speaking of the comedy, the majority of it comes off as shallow filler, especially when it comes to padding out Fuuko & Kotomi’s arcs. While some of it can be quirky depending on what characters are involved, much of it amounts to childish teasing and memery. Simple humor for simple minds essentially. The real issue is that there’s more of it early on than later, so while Fuuko & Kotomi’s arcs get enough time to have made substantial surface-level developments, too much time ends up getting spent on cheap humor for that to happen. After those two drawn-out arcs, the next arc does the opposite and crams two main girls’ (three if you count Ryou as a main girl, though the attention she gets is lacking enough to make this debatable) development into a shorter arc than the last two. There’s plenty of indications that Kyou & Tomoyo have more character than is initially presented, but little of it is delved into. Even the OVAs these characters received later don’t fully patch the holes this season makes in their development. This leaves the last arc (Nagisa’s) as the only arc where the pacing works. For what her rather standard dandere character is worth, she gets enough serious moments (including more that tie into the underlying story) to at least make her arc better than the others. So long as Nagisa herself doesn’t bug you it’s likely to be the best part of the season. So in the end, what this season has to offer plot-wise is the beginning of a supernatural drama which is tied into a poorly-paced and overall shallow high-school rom-com (until the last arc anyhow). However, before reaching a conclusion there is a need to discuss the production values, which as has come to be expected from Kyoto Animation is top-notch for the late 2000’s and holds up strong today. While Key’s huge-eyed character art style isn’t quite seamlessly integrated in this season, the overall picture quality is high and there’s a lot of smooth animation in place, especially for a story sourced from a visual novel. There’s also an impressive amount of detail put into the background art, which combined with the skilled use of filters allows the visuals alone to instantly set the mood, something the poorly paced story ends up relying on. The “illusionary world” scenes are particularly well made. The completely hand-drawn girl in the mostly CG world works astonishingly well, and the CG designs are so fitting that they hardly feel dated more than 10 years later. At least the constantly repeated gags get some good animation. Ever better than the visuals is the sound quality. In the Japanese dub, the skilled voicework gives the characters a more down-to-earth vibe than the silly comedy and abundance of melodrama would typically allow, which goes a long way in keeping things grounded enough for the underlying story to matter when it comes in between the surface shenanigans. As for the music, well, let’s just say I respect Jun Maeda much more as a composer than as a writer. It’s surprising how easily his music can instantly create a mood, even when it’s as simplistic as Clannad’s soundtrack. It’s been said that perfection is when there is nothing left to take away, and while I’m not the sort to throw that word around lightly there is so little that could be removed from Clannad’s pieces that the aforementioned saying instantly comes to mind when I listen to one of them. 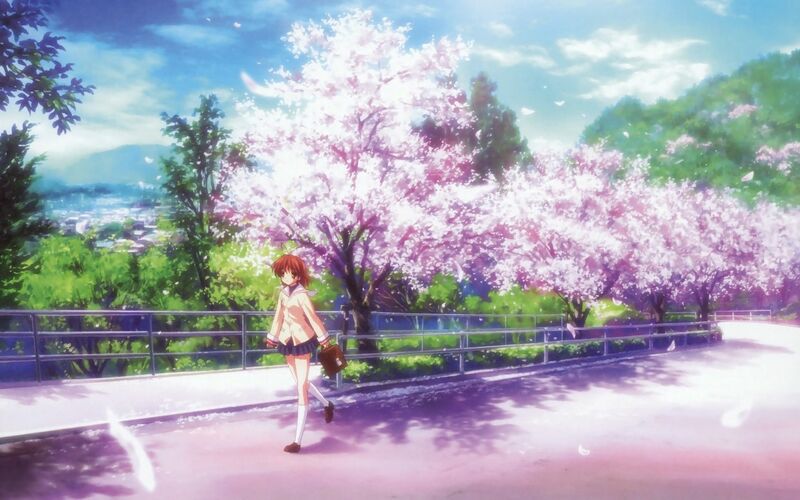 So, with all of that said and done, is Clannad worth your time? It’s always a tough call when I’m asked this, but the biggest decider is typically how patient the asker is. As cheesy of a rom-com as Clannad’s first season is, it’s not just a rom-com when you step back. Much like how the end of a budding adult’s education makes for a beginning more than it does an end, Clannad is only getting started here. This is not the end of yet another melodramatic romance, but the beginning of something far grander, the likes of which rarely show up in this medium or any other. While the stale exterior is not excusable, the story’s core does add a considerable value to the experience even before it’s been fully developed. It still is able to make some otherwise melodramatic moments work even if you don’t connect with the characters and even makes some of the jokes ring clearer. 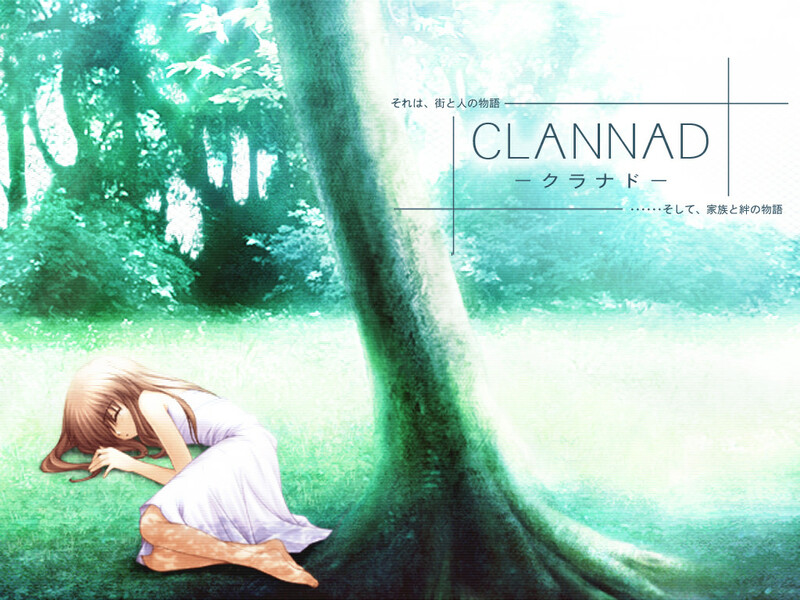 Clannad is not a fair-weather friend; it needs to be tolerated through thick and thin to be truly appreciated. Perhaps that description doesn’t sound very inviting for an anime, something often seen as entertainment first and foremost, and it’s not supposed to be. Even so, if you’ve read this far and haven’t experienced Clannad for yourself it wouldn’t hurt much to try out an episode or two. It won’t take long to figure out if you can tolerate Clannad’s faults or not. If you can’t there’s no harm in leaving it be and moving on, as skipping to After Story doesn’t even get you all the way past the story’s shakier portion and you’ll have missed too much to understand what makes the actual After Story what it is. If you can, however, you could easily find something so special that it changes your outlook on life.